Recollection for Priests and Religious working in the Diocese of Miao is a regular event every month. In the month of March too Priests and Religious from different parts of the Diocese came together in different places for their monthly recollection, followed by the Sacrament of Reconciliation. 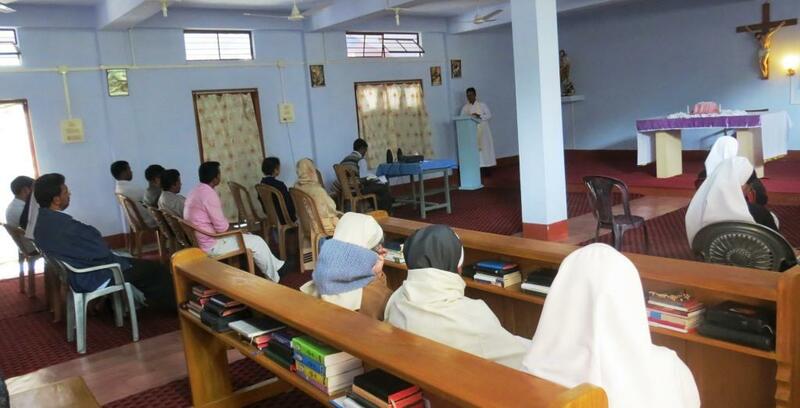 The Changlang District unit came together at St. Mary’s Convent in Miao on 8th March, 2014. The recollection talk was given by Rev. Fr. Jalumru Raju MPC from Christ the Light Seminary Miao. The day being the International Women’s Day, he based his theme on Jesus’ concern for the women and the vocation of women. He also highlighted the life and example of Pope Francis to drive home the need to be simple and humble servants in serving the people under our care. He used powerpoints and video clips to highlight how Jesus always supported women. The talk was followed by Eucharistic Adoration and Confession. There were 23 participants from Miao, Changlang, Neotan and Kharsang. The Recollection concluded with the Priests and Religious coming together to discuss on Nuncio’s coming the Diocese and Bishop’s House blessing in the month of May.